A woman and her two daughters were accused of causing death and disease in the village of Kandal Tuol. After taking an oath, peace came to the residents. Cambodian culture is closely linked to the occult and spirits. Traditional beliefs are so strong that they sometimes hinder the journey of those who want to become Christians. 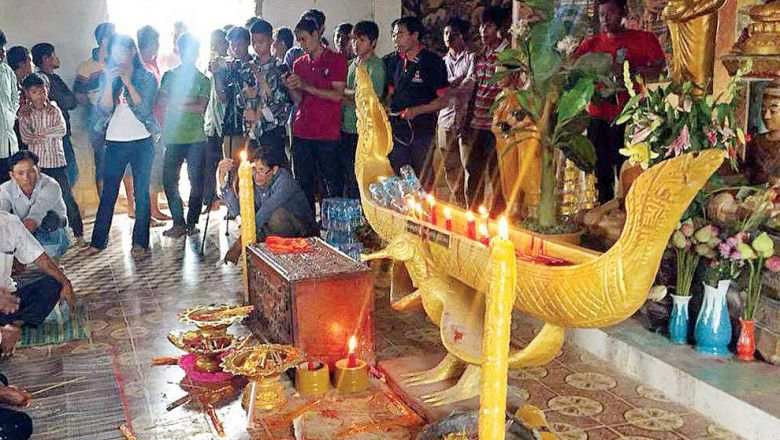 Phnom Penh (AsiaNews/Agencies) – Accused of sorcery, a woman and her two daughters have claimed their innocence in a pagoda in Kampong Trach district, Kampot province. About 170 residents of Kandal Tuol, a village near Kampong Trach Khang Lech, were present at the ceremony (pictured), which took place two days ago and during which the women took a solemn oath. Some villagers had accused Koh Sok, 38, and her daughters of being sorcerers, said the local police chief, Seng Sokun Chatt. According to rumours, the three were responsible for the deaths and illnesses that affected local residents. The service took place at the Dang Tong pagoda in a nearby district with 30 policemen, soldiers and representatives of the local government providing security. As a result of the ceremony, "Both sides agreed yesterday to stop accusing each other after drinking holy water," the police chief said. Prum Kim Cheu, the second deputy head of Kampong Trach Khang Lech, added that only about sixty villagers drank it, while others claimed that they were present only as observers. "The woman and her daughters have sworn that if they had really practised witchcraft, death would have fallen on the whole family" Cheu noted. Last week, the woman had sought local government protection after neighbours made the accusations. 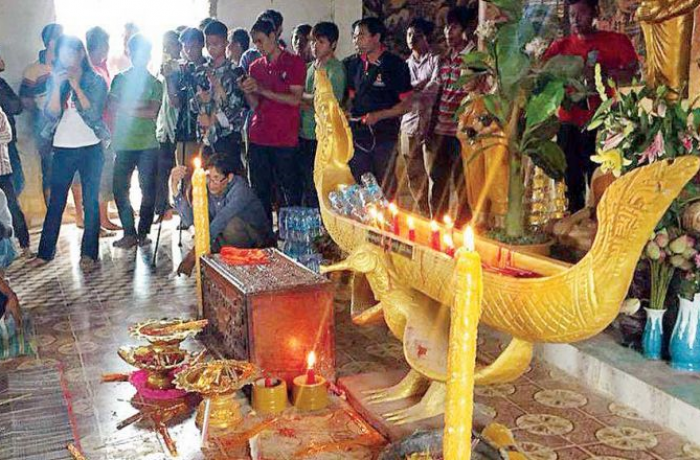 They believe the three learnt black magic from Koh Sok's 80-year-old mother, who is also accused of being a sorcerer. "They claim that the old woman performed rituals during which she would dance and chant the names of people who later died," Cheu said. In case of illnesses, locals "often prefer to rely on traditional healers rather than [modern] medicine", he explained. In certain social contexts, the first approach to illness "consists in driving away the spirit or the spell that struck the sick person". "Cambodian culture is very tied to the occult and to the spirits, in whatever form they are presented,” a priest who has lived in Cambodia for 20 years told AsiaNews. “Buddhism, the country’s dominant religion, however, addresses other aspects of life. It answers some questions but leaves others unanswered. The veneration of spirits addresses to the latter. "In each pagoda, in addition to the central statue of the Buddha, there are altars dedicated to entities to propitiate. Buddhism and spirits are cultural aspects that have grown together. “Outside pagodas, in the villages there are people, both men and women, who take care of officiating the blessing ceremonies or making amulets that protect the wearer." The link between Cambodian society and traditional beliefs is so strong that it sometimes hinders the journey of those who want to become catechumens. "With my faithful I often insist on the figure of Jesus driving out demons and spirits,” the clergyman explained. “I try to make them understand that the Lord is stronger than everything and that if you rely on Him, you need not fear anything. "One of the images I often use during catechism is the one that depicts the Risen Christ who, enveloped in light, causes the spirits to flee. The question I ask of those who want to be baptised – something that allows me to understand if the person is ready – is this: 'From now on, to whom will you entrust yourself: Jesus or them?'"